This Weekend’s Winners: The top three films — The Hobbit (No. 1 with $32.9 million) out-grossed Django Unchained (No. 2 with $30.7 million) and Les Misérables (No. 3 with $28 million). Also: Box office overall staged a comeback for the year, recovering from a disastrous summer with a holiday box office furnace raging, ending the weekend up 20 percent over the same time last year, and ending the year with admissions up by 5.6 percent — the biggest single increase in a decade. This Weekend’s Losers: What began as a tepid response to Tom Cruise’s Jack Reacher (No. 5 with $14) has cooled just a bit more, with the film losing a tenth of its already-thin opening weekend audience. With a worldwide cumulative gross of just $67 million, the $60 million Reacher looks like a disappointment. So, too, This Is 40, (No. 6 with $13.2 million) which will be lucky to wind up where Jack Reacher is right now. How It All Went Down: Did Bilbo really beat Django? 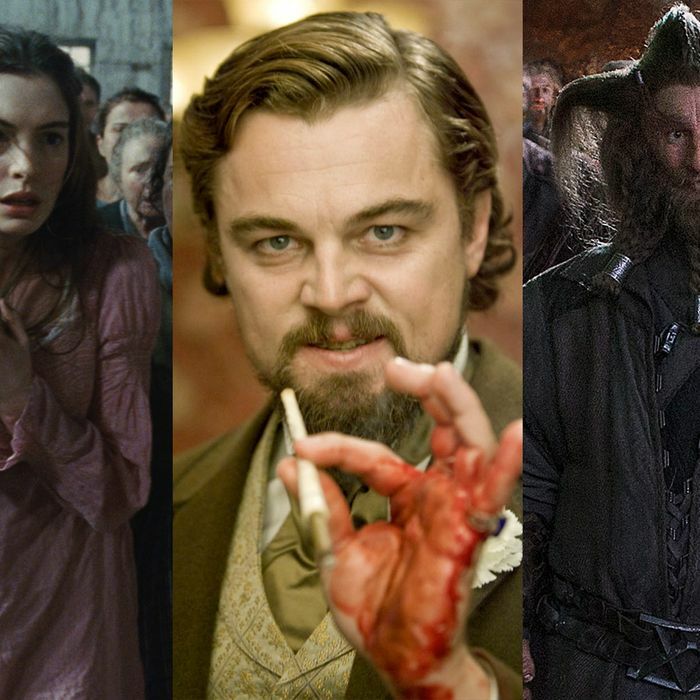 On paper, yes, the first third of the tuchis-numbing The Hobbit took in a little over $2 million more — but it’s worth noting that Django Unchained (already on-pace to become Tarantino’s highest-grossing film ever) was actually playing in a thousand fewer theaters than The Hobbit this weekend. Let that sink in for a moment: a thousand fewer theaters. Regardless, Peter Jackson’s epic, which opened Dec. 14 with the largest December opening ever, still lags behind The Two Towers and The Return of the King. Meanwhile, if your wife went missing for 158 minutes over the weekend, there’s a better-than-average chance she was at Les Misérables: More than two thirds (67 percent) of its audience was female, and boy did they love them some Fantine: They gave it the rare A+ CinemaScore rating, which means it should continue to do brisk business over the New Year’s holiday. Not so for the Judd Apatow comedy This Is 40, which despite actually improving its grosses by almost 15 percent over the weekend has been hobbled by weak reviews and will be lucky to peter out in the mid-sixty-million range. For a film sold as the “sort of sequel to Knocked Up” — the 2007 comedy sleeper that grossed almost $150 million domestically and almost $220 million worldwide, this is a dire result. Finally, despite a summer of unmitigated box office bombs, unspeakably dark nights (Aurora, Colorado) and summer movie attendance at a near twenty-year low, 2012 actually saw the movie business rebound after two back-to-back years of decline. Revenue was up 6 percent, and for once, it wasn’t because ticket prices were up 6 percent, too: More people went to the movies this year — 5.6 percent more people, actually. Could it be that there’s actually an inverse relationship between usurious 3-D ticket prices and box office attendance? It’s actually not such a crazy notion. Movie ticket prices overall have actually been on the downslope after having hit a record high during the summer. Despite concerns that theaters would seek to amortize the cost of 3-D on the backs of their 2-D customers, the opposite has actually happened: This year saw a hefty 18 percent decrease in the number of 3-D films in wide release, and with fewer 3-D movies in the marketplace, movie tickets are actually dropping in price, making them a more appealing prospect for the cash-strapped this year. Still, one thing that won’t change regardless of which dimension you experience a film in is Hollywood’s reliance on the blockbuster franchise. Indeed, if you absorb no other fact about just how important they’ve become, make it this one: Theatrically released films grossed about $10.8 billion this year, but just five films in 2012 — The Avengers; The Dark Knight Rises; Skyfall; The Twilight Saga: Breaking Dawn — Part 2; and The Hunger Games —accounted for nearly half ($4.99 billion) of that tally. Happy New Year.